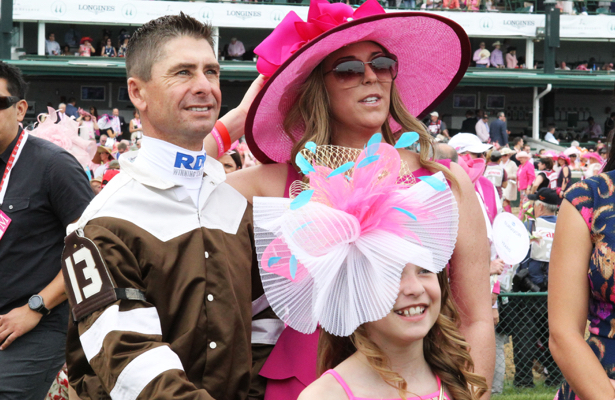 Shantel Lanerie, the beloved wife of Churchill Downs’ 15-time champion jockey Corey Lanerie and devoted mother of their 10-year-old daughter Brittlyn, passed away late Friday afternoon at Norton Women’s and Children’s Hospital in Louisville, Ky. She was 42. Shantel Lanerie was diagnosed with Stage 1 breast cancer earlier this year and had been undergoing chemotherapy treatments to battle the disease. She was admitted to the hospital Thursday to treat what was diagnosed as sepsis – a severe infection – and underwent emergency surgery that evening, according to family friend Gary Palmisano. Sadly, her courageous fight ended Friday. Raised in Cecilia, La., Shantel was the daughter of a trainer and met her future husband when he began riding at Evangeline Downs in Opelousas, La. in 1991. They were married April 11, 1997. After dominating the Texas and Louisiana horse racing circuits, Corey and his wife moved to Kentucky in the spring of 2005 and took up residence in Louisville’s Lake Forest community. While watching her husband ride, Shantel held various positions at the track primarily before their only daughter Brittlyn was born in early 2008. She worked as a tab writer with the clocker at Lone Star Park, a mutuel clerk at Fair Grounds and a photographer’s assistant at Churchill Downs. As Corey’s success reached new heights with the first of 15 Churchill Downs riding titles at the 2012 Spring Meet, Shantel and Brittlyn were often spotted and recognized in the Churchill Downs’ winner’s circle while sporting wide smiles and the most stylish fashion. Additionally, Shantel was famously known around the racetrack for her hospitality and delicious Cajun cooking as she often whipped up memorable meals for family and friends after the races and on “dark days” at their Louisville home. After being diagnosed with breast cancer earlier this year, Shantel was one of 144 women that walked in the always-stirring Survivors Parade on Kentucky Oaks Day at Churchill Downs and a video that told her story was shown throughout Churchill Downs on the Big Board. Jockeys wore pink “Fight With Shantel” bands around their legs on Kentucky Oaks Day. Those bands somberly returned during Friday’s racing program at Churchill Downs. In addition to Corey and Brittlyn, Shantel is survived by her mother and father, Katie and Riley Hebert; brother Rylan Hebert; and mother-in-law and and father-in-law Debbie and Gerald Lanerie. At the time of Shantel’s passing, the family was surrounded by members of the Churchill Downs jockey colony, including Robby Albarado, Brian Hernandez Jr., Ricardo Santana Jr., Julien Leparoux and Samuel Camacho Jr.
A memorial service in Louisville and funeral in Louisiana is pending.